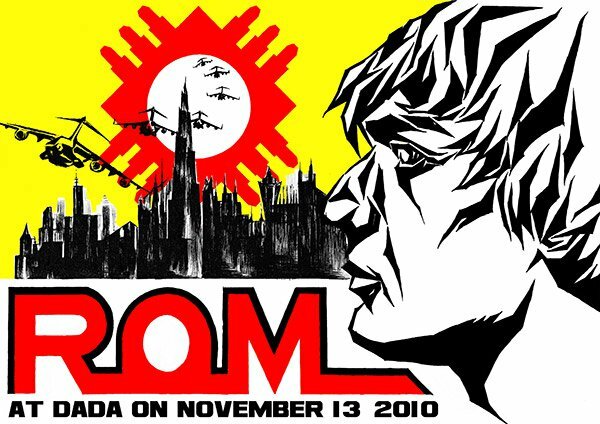 This Saturday’s big event is the release of the long-awaited ROM album on PAUSE:MUSIC. 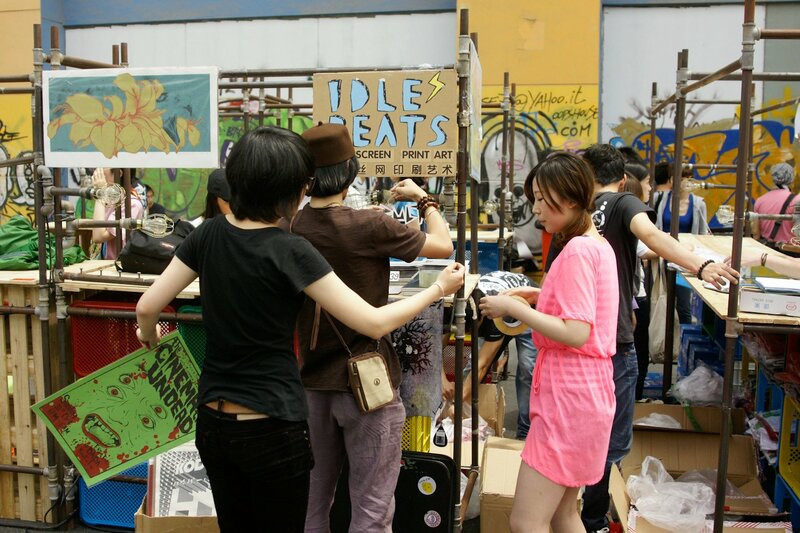 ROM is probably the most inventive and individual crew in Shanghai, and certainly Sub-Culture’s favourite! 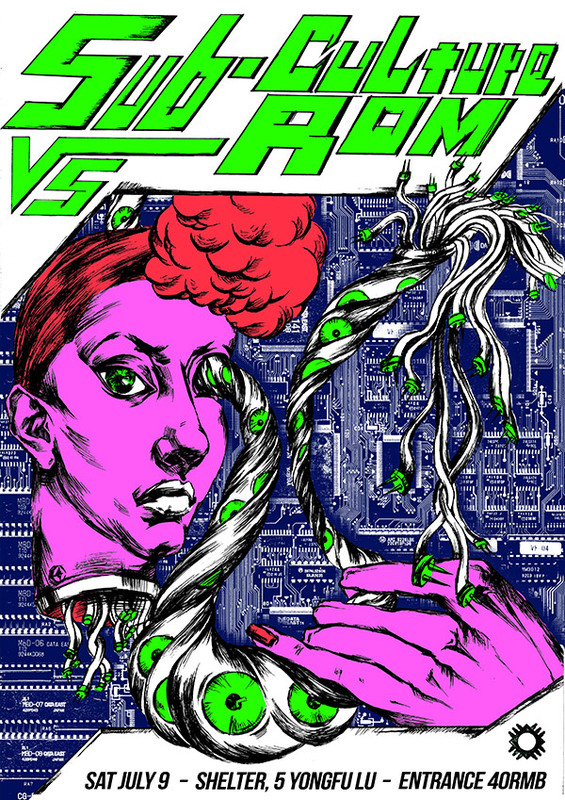 ROM consists of the sharp tongue of icenine, the visual mind of Olivepixel and the turntable skills of Deville. 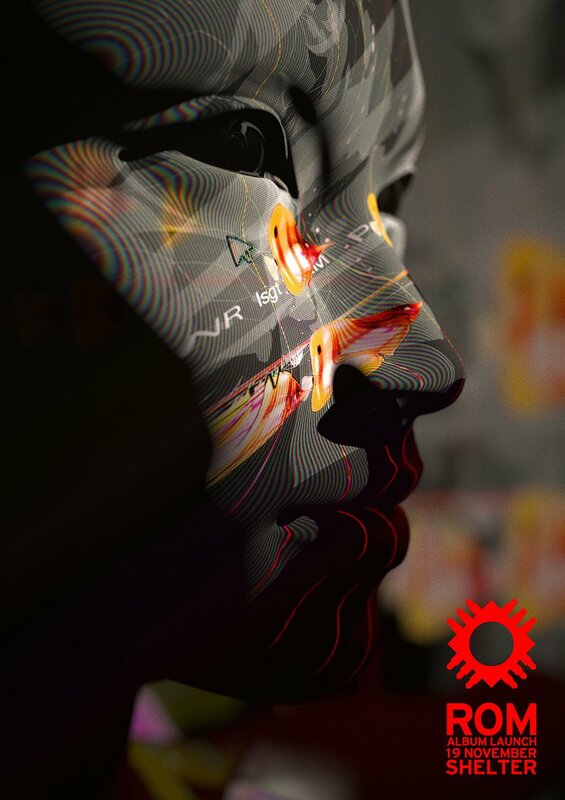 From what we’ve heard from the crew about the live show they are planning for the release, this night is going to be something quite unique and special (lazers, smoke, strobes, augmentations, 3d business….) and the album itself is an absolute killer! Make sure you get down to The Shelter this Saturday, no excuses!! After a year of beta-testing our multi-sensory firmware, ROM is ready to release our latest reality chip. The first five hundred copies will be packaged with an audio CD and magazine replica commemorating the death of physical media. Complete with material performances by actual people, ROM celebrates the future by looking back at the past. ROM executives icenine, olivepixel and Blaise Deville present a product analysis and live demonstration. Historical experts Downstate, Cavia and Drunk Monk complement the night with a fitting soundtrack that all futures will remember! Hosted by ‘The Shelter’- a local favourite, and one of the best surviving venues of the resource wars. Ok, so its been a while since we did one of these. Now that we are back in Asia we are gonna make sure this goes back to being a weekly post. Only a handful of events this week, pretty quiet time of year. To add an event please email us at subcultureshanghai@gmail.com. 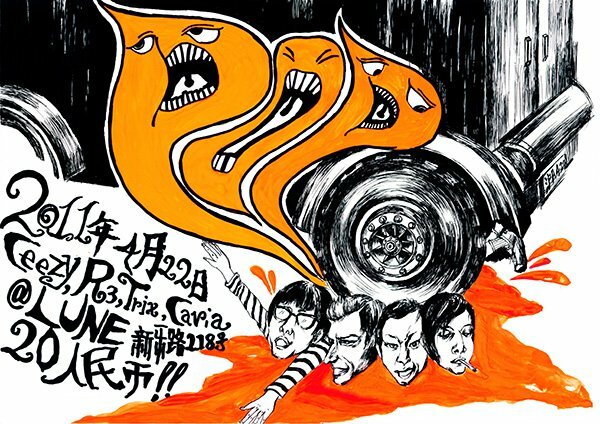 This month’s Sub-Culture poster was designed by Shanghai’s own Cheeri Wang. 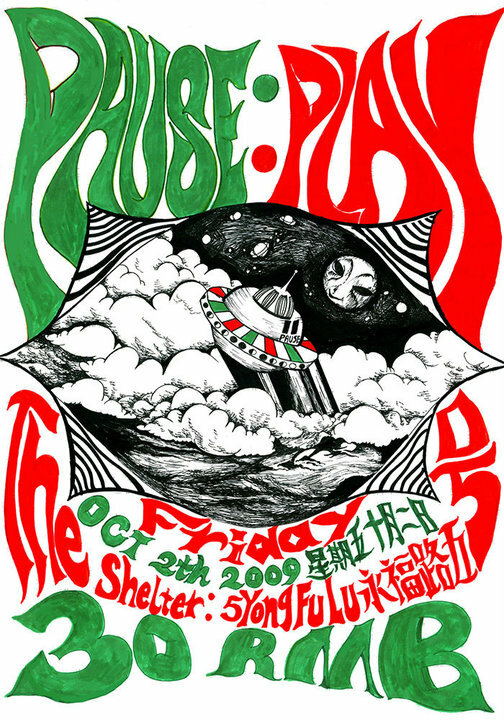 Cheeri has been involved in the Shanghai music scene for a good few years now, making posters for the likes of ROM, PAUSE, Freakaholic and POP, as well as more recently working together with IdleBeats. We caught up with one of our favourite Shanghai artist’s to get to know a bit more about her work, influences and future plans. Sub-Culture: Ok, so first of all please can you introduce yourself and tell us a bit about what you are doing these days? Cheeri: Ok, I’m Cheeri Wang, I’m Shanghainese…. I live in Shanghai with friends…..hahahha, this is quite difficult for me to introduce myself. Ok, before I met Nini and Gregor I’d already been thinking I want to start screen-printing but I didn’t know anyone doing it or anywhere I could learn. After I met them I was really excited that I’d found the right people to work with. I think me and Nini both want to make the Idle Beats group bigger, get more people to work with us, and make the group more powerful. 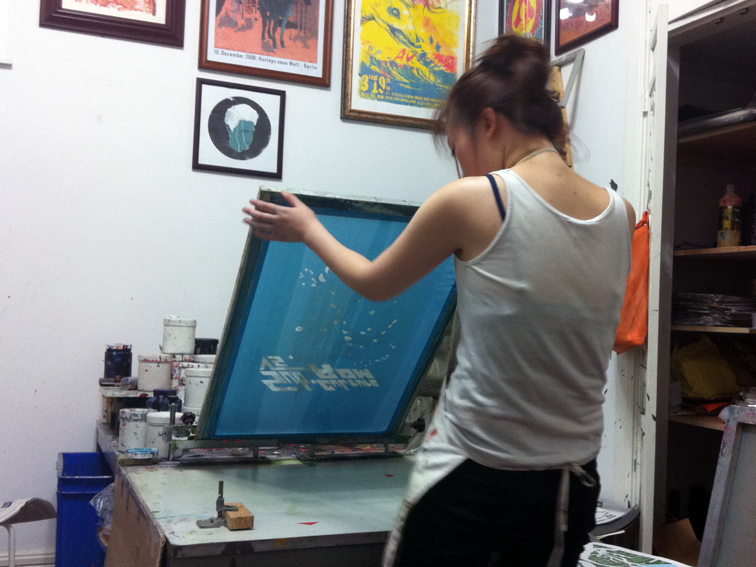 Also, now in China not too many people know what screen-printing is, or even art really. If they want to buy art they just want to buy the most expensive pieces or famous foreign artists. Also now some Chinese artists work is not that good but they are becoming popular. I want to let people know about different kinds of art. Now they only know about oil painting or more traditional styles, they don’t know anything about screen-printing, graffiti, etc. Art is a culture, a bit like hiphop, so I want to try and get people into the culture and hopefully they can enjoy it. Sub-Culture: So when did you first start as an artist? Cheeri. Haha err a long time ago. 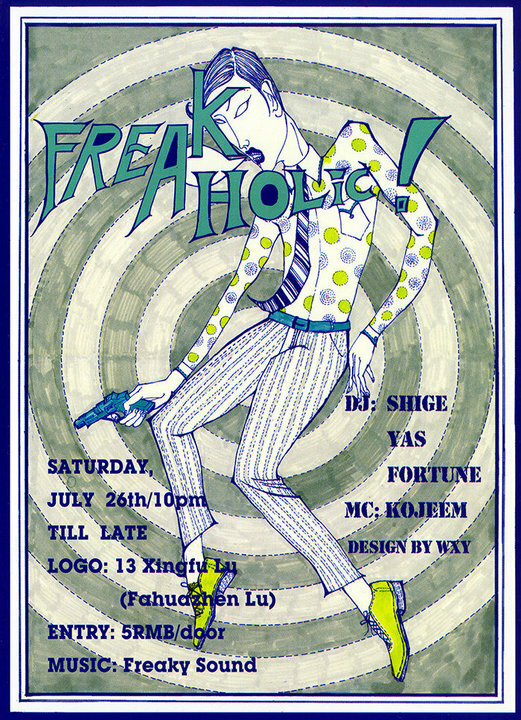 Maybe 4 years ago I started when me and my Japanese friend had a party called Freakaholic. That was the first time I designed a poster for an event. Sub-Culture: But you were an artists before that yeah? You studied art at university? Cheeri: Yeah yeah, I studied art in college maybe 6 years ago. Sub-Culture: What was it you were studying? Can you tell us a bit about that? Sub-Culture: So do you still practice the traditional styles now? Cheeri: Mmmm sometimes but not really, haha. I really should do, but it takes a lot of practice and you should do it everyday. If you don’t do it for a couple of months its very difficult to get back into it and its like you have to start over again. Sub-Culture: In the past few years you’ve designed a lot of posters for events such as Freakaholic, Pause, POP and now Sub-Culture. When someone asks you to make a poster, how do you start? 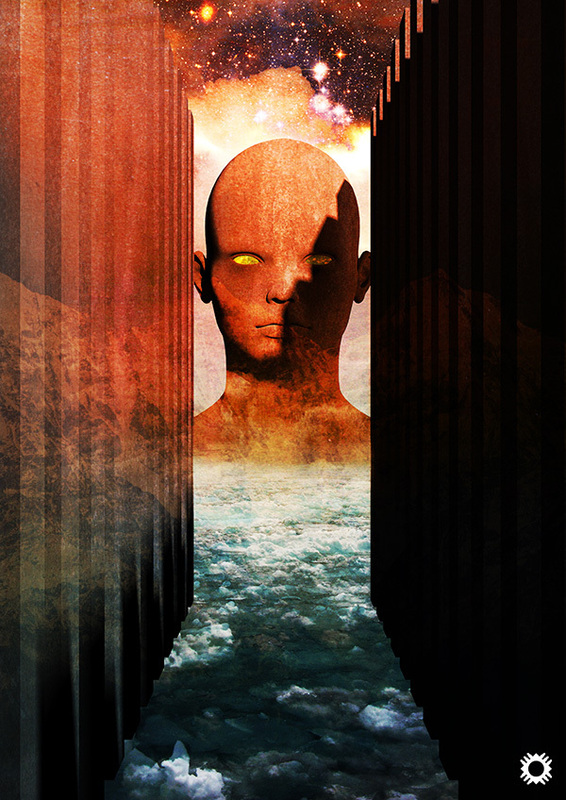 Where do you take the inspiration for the image? Is it the type of music? The guest DJ? Cheeri: Ok, so for example with the Freakaholic parties, most of the DJs they played hiphop, so I would think about the style and collected a lot of old school style posters from the 70’s, 80’s and 90’s on my computer to use as inspiration. But I never copy a style or an image, I never want to do that, too many Chinese people do that, hahaha. So Id find an image I like but then mix it with my style, my personality. As an artist you need to let people know your personality. With PAUSE, those guys said I could do anything I wanted as long as the logo was in there somewhere. That way I really like as I can put more of my ideas and style into the poster. Also, with POP that was also different. Cavia would give me the idea as he wanted to use current affairs or events which had recently happened in China. Sometimes he would give me a picture and say that I can use my own ideas and style but to use the image or topic somehow and let people know what the topic is. This is also a very interesting way to do it but sometimes he would give me a picture that was very ugly so it was quite difficult to keep the theme but also make a nice, good looking poster. Sub-Culture: Yeah I remember one of the posters was a car or truck running over the DJ’s playing that night. What was the original image he gave you there? Cheeri: Ah the second one? Hahaha you don’t know right? Ok a few months ago there was an incident in a small town in China. There was a guy who was working for the government and he would always try to help the normal people. You know there is a lot of corruption these days in the government but he was really against it and would try to stop it, but finally he was killed. Some people say that it was the police or government that killed him but then afterwards they put his body in the middle of the road so he would get run over by a car and they said it was an accident. There was a picture on the internet which became quite famous of the guys body that had been crushed by a truck, with his head “squelch” haha. It was quite disgusting. But for me I can’t just draw like that so I had to change it, but the problem is once I change it then people like you don’t know what the original picture was. Sub-Culture: Ok, so can you explain a bit about the Sub-Culture poster. What was the idea? Where did it come from? Cheeri: Yeah this time is quite special as its Sub-Culture VS Rom. Before I also made 2 posters for ROM so I already know what they want, what style, kind of futuristic and powerful. Originally this image I drew maybe 3 months ago. One day I just had the idea so I did a rough sketch and then Kin saw it and said I should definitely make this into a poster one day as it’s a really cool image. I thought he was right so I used this image but worked on it more to make it cleaner and perfect. 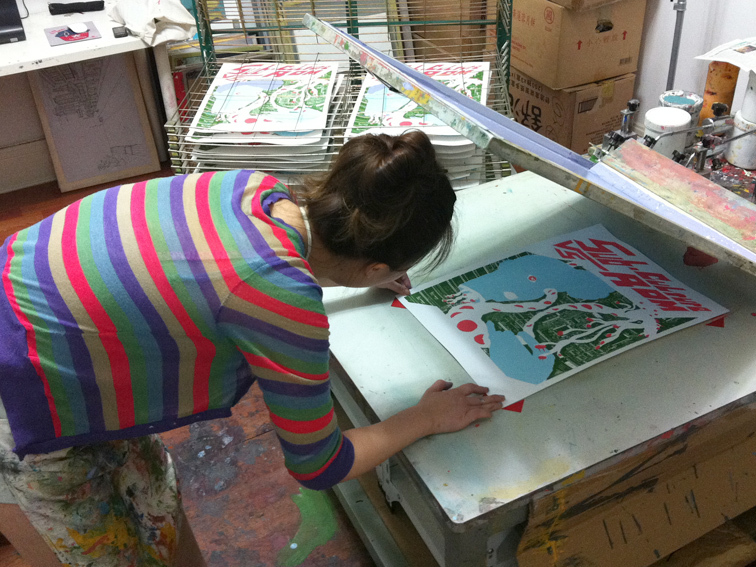 Also, as it was for Sub-Culture I was also thinking about the screenprinting as they screenprint the posters every month. Before a lot of my work was in black and white, maybe with just one other colour, which I really like but this time I wanted to start to try and use more colours. 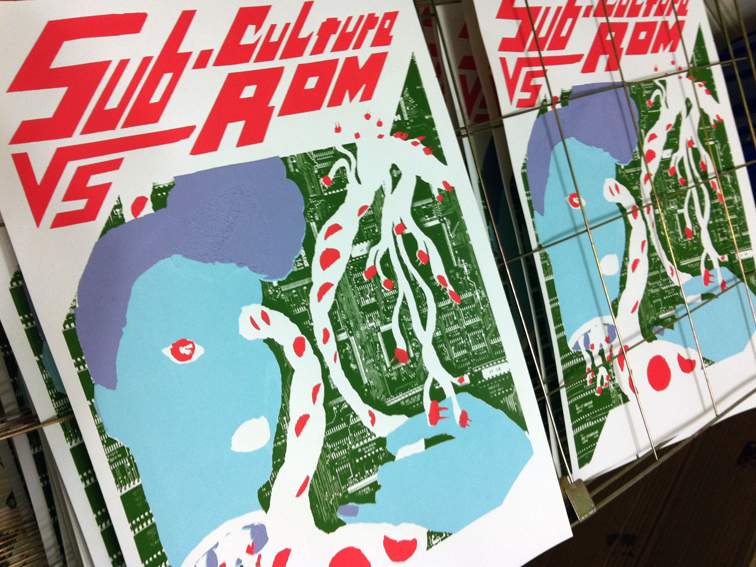 Sub-Culture: And you’ve been making the screen-prints of the poster this week? Cheeri: Yeah. For me its still quite a slow process. 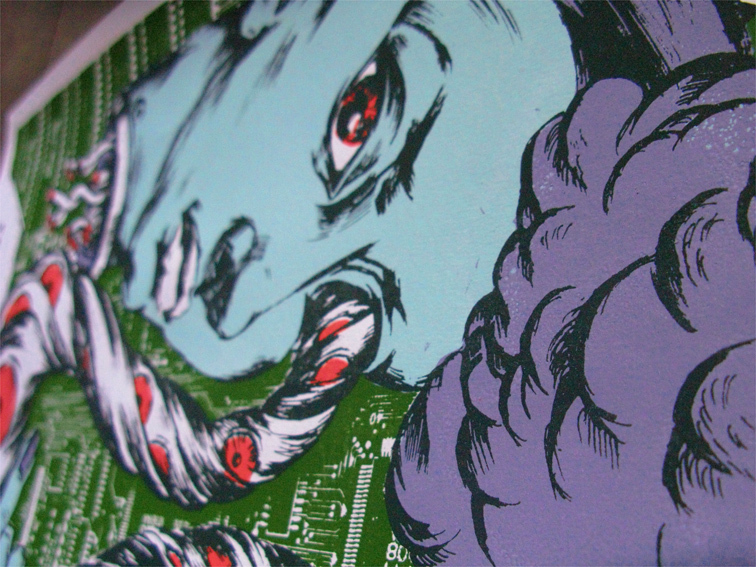 Up to know I have only produced maybe 4 screen-prints by myself and actually its quite difficult. Nini has done a few events showing people how to screenprint but what she showed people is actually the easiest part of screenprinting. Before the actual printing stage there are a lot of things to prepare and each step is very important. If you make a small mistake or problem it will cause a much bigger problem later on in the printing process and the final result will be really bad so each step you should take very seriously and be careful. For me I still don’t have a lot of experience so each step I always have some problems so I always have to work out how to solve it. Actually Nini is a very good teacher, she lets me make mistakes and I have to work out the problem by myself. If I ask her she will help me and tell me what to do, but I think its good I learn by my mistakes. Sub-Culture: So which other Chinese artists do you like? Cheeri: Actually, I don’t really know many of the ‘high level’ artists in China. I like to follow the artists that are around me. I like a Japanese guy who lives in Shanghai called KSK. He does some really good graffiti. I saw some work he did in a friends shop and other places, its really good. He doesn’t really want to be an ‘artist’, its just art is kind of part of his life and if he has an idea he does it. I like this style actually. Also I really like XiaoLongHua, I really like his style. He doesn’t only make one style of art. Sometimes he makes comics, sometimes graphics. I heard recently he’s working on some wood sculptures. I’d really like to try that one day. Sub-Culture: Also, I’ve heard your working on a comic book for ROM to go along side icenine’s album. Can you tell us a bit about that project. Cheeri: Yeah. The comic book is set in the future, but not too far in the future, maybe 20 years or something, so you can feel that its maybe a possibility. I like this idea. 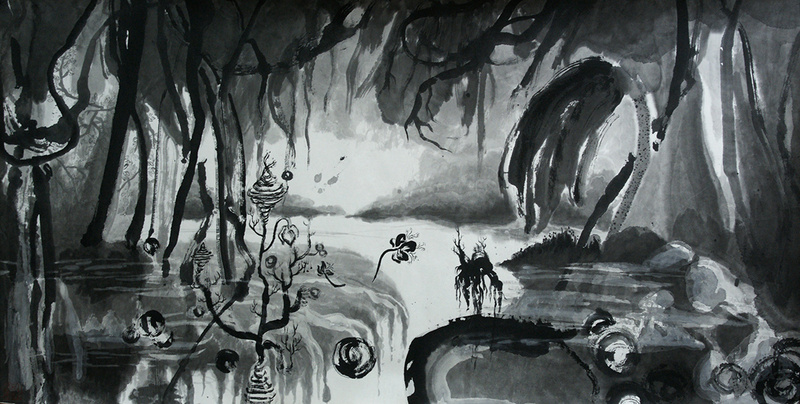 There are many artists involved, like XiaoLongHua, who I think is getting quite famous now haha. There is also an ABC girl who isn’t really an artist but she likes to draw. I’ve seen some of her drawings and they are really nice and if she keeps on doing it will be cool later. Some of the artists will make just one image for the comic, but I want to make a short story. I’ve already started it now and I’m really enjoying it. Comics take a long time to make as each scene you really have to think about. There are many different styles of comics and ways to do it, but the artists I like they are able to make each scene or picture in the comic a work of art by itself, like you could take any picture from the comic and frame it separately and it would be a piece of art and not just a sketch or a part of a story. I really like this style. Each story is always very short but very interesting and the artistic skills are very good so it makes it very powerful. I think after this comic I want to make an exhibition of black and white pieces, maybe with 3 short stories made up from a few different pictures. 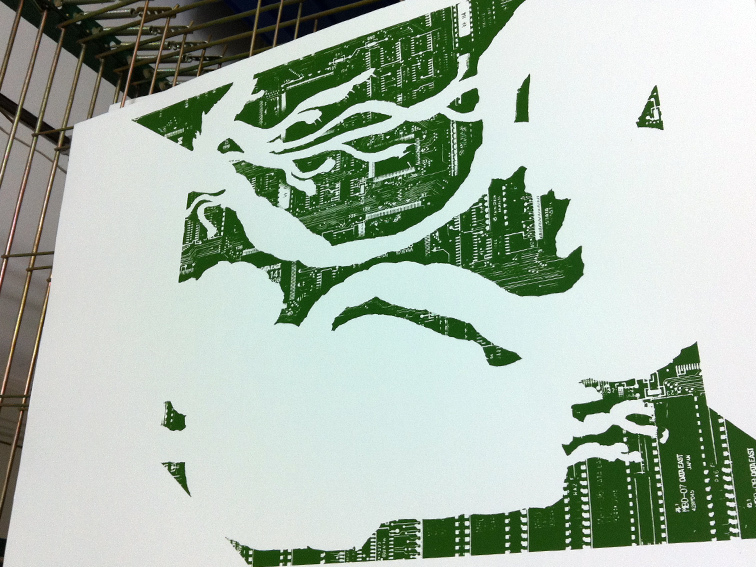 I will also make screen-print posters for it. Ok, last week we were a bit burnt out and the beautiful Shanghai weather was sucking out all our motivation to do anything so we didnt post much on here, but this week we are forcing ourselves out from under the a/c to add to the summer heat! This Saturday see a special collaboration at Shelter between ROM and Sub-Culture! ROM’s icenine is leaving Shanghai for a few months the day after the event, and then a few days after that Drunk Monk and ChaCha are gonna be M.I.A. for a while so we are having a proper Sub-Culture send of for them all! Here’s all the details, and check the dope poster by Cheeri Wang above! We will have an in depth interview with Cheeri later this week, plus we will also have a special guest vocalist on the night which we will announce very soon, so keeping checking back and keep updated!! Get ready for an all-out musical massacre as Shanghai’s purveyors of a bleak future go head to head with the heaviest vibrations in the city – ROM VS SUB-CULTURE! 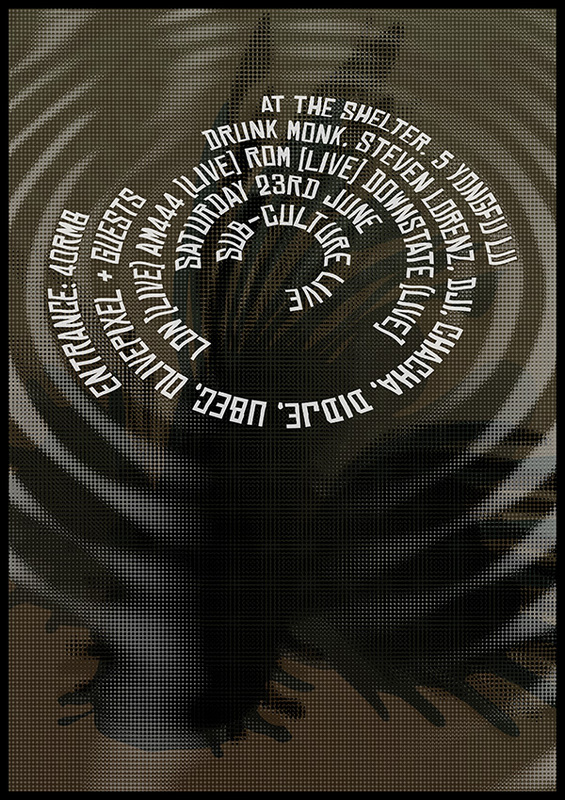 A full audio/visual line up featuring a live set from icenine (the last one for quite sometime), dj sets from the likes of Drunk Monk,Cavia, Steven Lorenz and dji, all with vocal support from the Sub-Culture MCs and live visuals from Olivepixel! 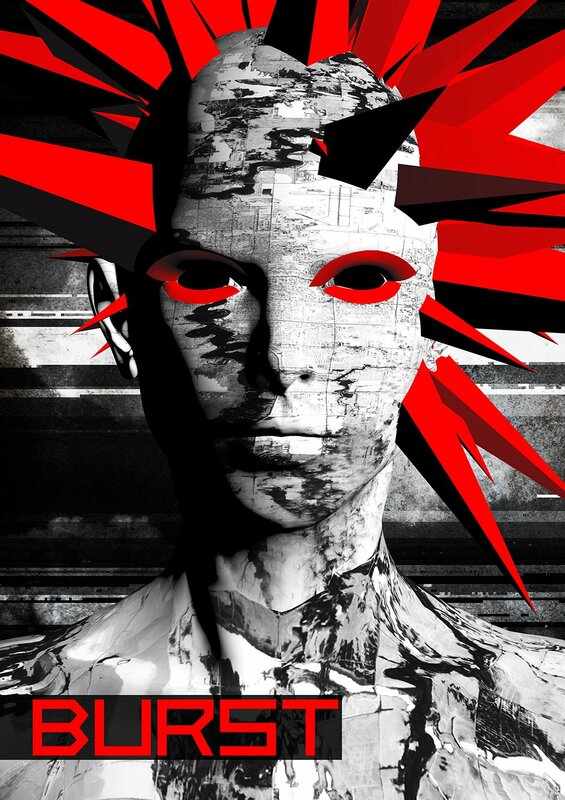 Dubstep, Grime, Juke, Techno, DnB, HipHop and UK Funky on the system. Not for the faint hearted!! Thanks to everyone who cam out to last week’s Sub-Culture with Oilworks and Hamacide! Was a lot of fun and Olive Oil’s set in particular was amazing! 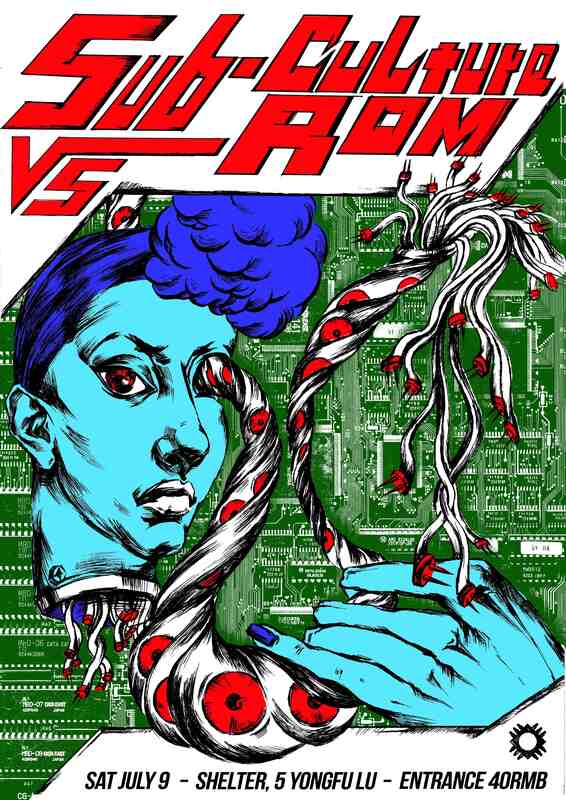 Next up Sub-Culture are going head to head with ROM on Saturday 9th July!! Check the killer new poster designed by Cheeri Wang!!! Here’s some stuff happening around Asia this week. We’ve probably missed loads of stuff, so to add an event please email us at subcultureshanghai@gmail.com.